Ruthie and I toasting up some tasty sautéed red onions. 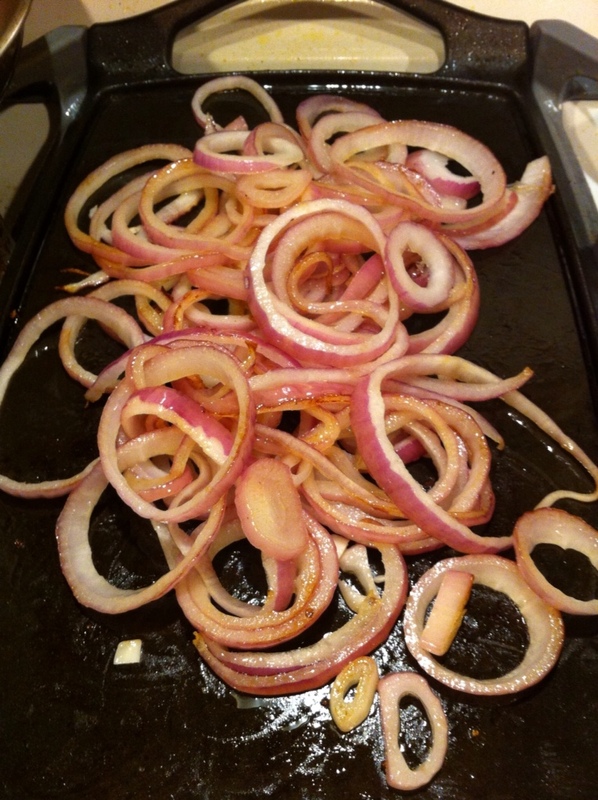 This past year, after 53 years of not wanting to try red onions, I finally, for no reason really, tried them and decided I really liked them. Yes, even I think this is pretty bizarre. For most of my life I did not want anything to do with onions. I drove my family nuts because everyone else in the family likes onions. I think most of it has to do with my wife Ruthie and the much healthier lifestyle I have adopted since we have been together. We will celebrate eight years of marriage October 10th. She cooks so much with onions I first started eating cooked onions, which I have to admit are pretty good. I never did graduate to eating raw (regular) onions, but for some reason, I think it was while we were on this year's trip to Colorado for my son's wedding, I finally tried red onions. Boy are they tasty! Our friends Joe and Risa Liken were on the driving trip with us and they thought I was crazy to first start eating them at 53. Ruthie just smiled and enjoyed another triumph of her common sense approach to all things natural. I still won't eat the other types raw btw.